Accepta Activ-Ox Foam Cleaner is a two-part solution incorporating a Part A & Part B mixed together at a ratio of 1:1 and diluted with water to create a powerful solution to be applied to cooling tower pack as a high cling foam. Description and application details below. You can order chemicals separate or as a set. Accepta Activ-Ox Foam Cleaning system offers the ability to effectively clean light to moderately fouled packs in-situ by combining the disinfecting power of chlorine dioxide with the cleaning and descaling power of a weakly acidic surfactant mixture. The system produces a high-cling foam which is applied to the surfaces to be cleaned under low pressure. The potential hazard of aerosols is avoided and the cleaning effect can be observed visually. Accepta’s innovative cooling tower cleaning system is especially useful where it is not practical to remove the tower packing. Accepta Activ-Ox Foam Clean is based on phosphoric acid and incorporates a foaming agent tolerant to acid and chlorine dioxide. 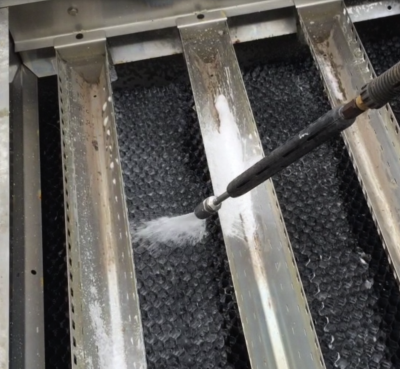 Foam Cleaner is a two part solution supplied as an A & B component to be mixed at a 1:1 ratio to create an instant reaction of acidic chlorine dioxide for a complete cooling tower pack cleaning system. Foam Cleaner forms a stable wet high cling foam that will flow slowly through the tower packing cleaning, descaling and disinfecting as it progresses. It is mildly acidic so as to remove inorganic scales. Required equipment: Spray Systems Jet Stream Foam Unit and compressed air supply or jet washer fitted with special foam lance attachments. Agitate to mix and decant into the foam unit. Vertical surfaces of the sump (if they require foam cleaning). The foam should be applied sufficiently dry to cling to the vertical surfaces with only a gradual creep under gravity. NB If necessary to enter the sump to apply the foam then normal vessel entry / confined space requirements should be observed and full-face respirator with a B2P3 filter cartridge worn. The cooling tower pack and vertical surfaces above the packing. The foam consistency should be adjusted to enable the foam to percolate slowly through the pack without excessive liquid run-off. Discard all unused activated foam solution.